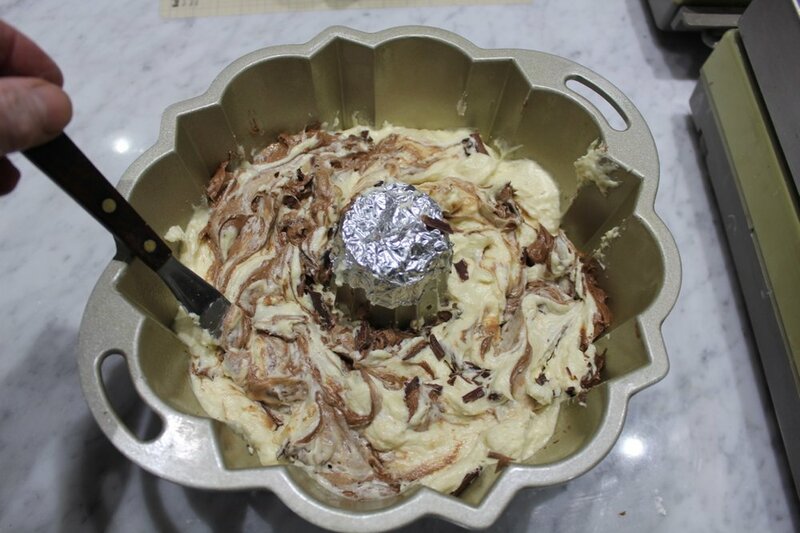 Radio talk host, Joan Hamburg, reminisced to us about a marble cake her mother would make in the 1950s that had chocolate curls, when we did a podcast interview on her radio show for Rose’s Baking Basics. We have mixed in mini chocolate chips into cake batters. 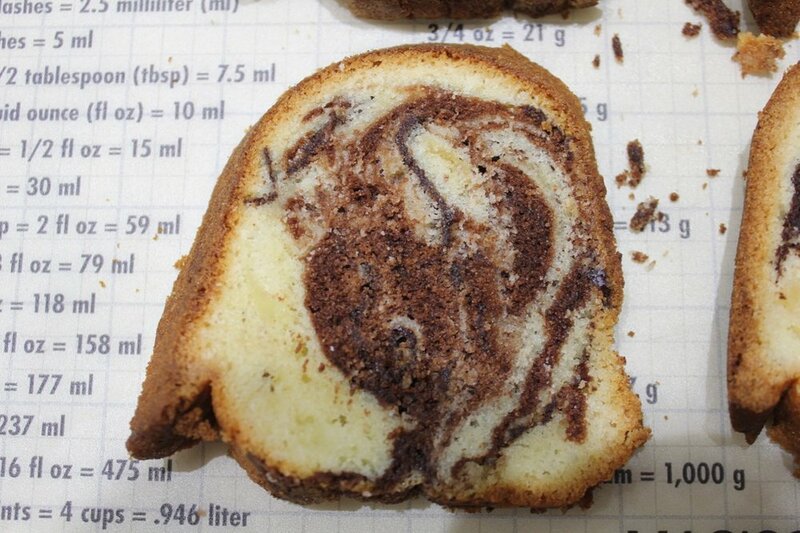 So I took up the quest to see if incorporating chocolate curls would work with our Rose’s Baking Basics Marble Cake. To lighten the color of the non-chocolate batter, I substituted whole eggs for the egg yolks. I also have included TIPS on how we test a recipe and make cakes. TIP: READ the RECIPE in its entirety and re-read any sections so that you are comfortable with carrying out the recipe. Special Equipment One 12 to 15 cup metal fluted tube pan (see Notes), coated with baking spray with flour. TIP: Nordicware’s Anniversary 10-15 cup cast aluminum pan works well. TIP: Add up the gram weights of the recipe’s ingredients, taking in account if an ingredient is reduced in the recipe. Weigh the finished batter, which should only be less by 3-5%. This batter is 1412 grams. TIP: assemble all of the ingredients, measuring apparatus, and likely tools you will need. This will help to make sure that all of the ingredients are used. * 30 minutes to 1 hour ahead, set the 50% to 55% dark chocolate, butter and eggs on the counter at room temperature (65˚ to 75˚F/19˚ to 23˚C). * Set a block of chocolate in a warm place, under a lamp, or warm it with 3 second bursts in a microwave, turning it over several times. * Place a quarter sheet pan or small cookie sheet on a counter top or on a scale if weighing. * About 30 minutes ahead, melt the chocolate: In a small microwavable bowl, stirring with a silicone spatula every 15 seconds (or in the top of a double boiler set over hot, not simmering, water, stirring often—do not let the bottom of the container touch the water), heat the chocolate until almost completely melted. * Remove the chocolate from the heat source and stir until fully melted. Let it cool until it is no longer warm to the touch but is still fluid. whites. We will use the egg’s shell to remove the extra whites. 1) Into a 2 cup or larger measure with a spout, weigh or measure the eggs. Add 60 grams/1/4 cup of the sour cream, and the vanilla and whisk just until lightly combined. 2) In the bowl of a stand mixer fitted with the flat beater, mix the flour, sugar, baking powder, baking soda, and salt on low speed for 30 seconds. 3) Add the butter and the remaining sour cream and holding the beater with your hand, mash the butter and sour cream into the flour mixture so that it doesn’t jump out of the mixer when beating. Then mix on low speed until the dry ingredients are moistened. Raise the speed to medium and beat for 1-1/2 minutes. Scrape down the sides of the bowl. 5) Remove almost one third of the batter (354 grams/1-1/2 cups) to a bowl and stir the melted chocolate into it until uniform in color. TIP: you can also use a hand mixer on medium speed. 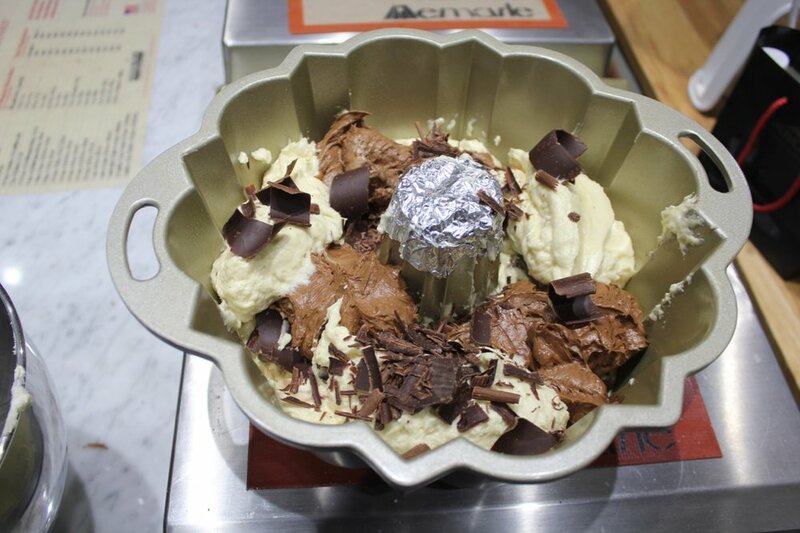 TIP: for bundt and tube pans, putting a foil “cap” over the center tube will keep batter from going down it. sure you did not forget an ingredient. 6) Spoon one-third of the remaining batter into the prepared pan. 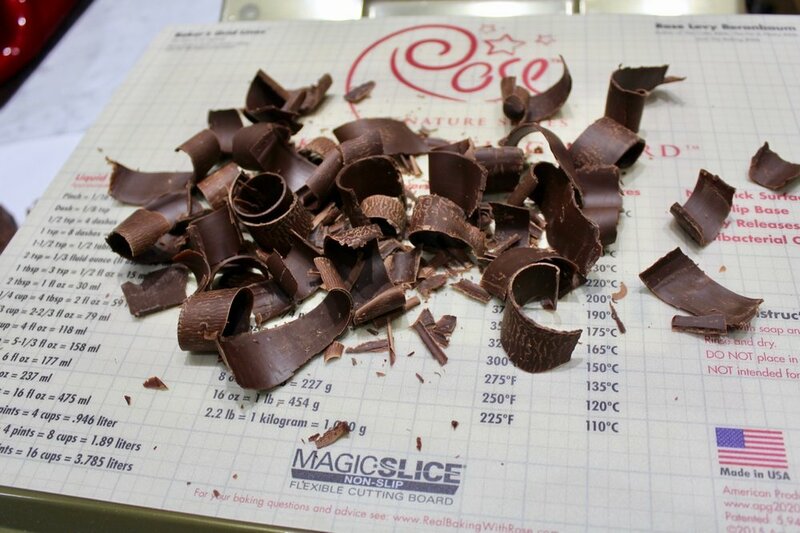 7) Sprinkle one-third of the chocolate curls on top (preferably the smaller ones and pieces). With a regular tablespoon, lightly fold and swirl the curls into the batter. 8) Top with dollops of half the chocolate batter. Spread it gently but evenly. 9) Top with another one-third of the plain batter and another one-third of the chocolate curls. Lightly fold and swirl the curls into the batter. 10) Top with dollops of the remaining chocolate batter. Spread it gently but evenly. 11) Top with the remaining plain batter and chocolate curls spreading them evenly over the top. 12) Marbleize the entire batter lightly: Dip in the tablespoon, without touching the bottom or sides of the pan, and lift up the batter in a folding motion like the roll of a wave. Repeat this motion 3 to 4 times, all around the pan. Smooth the surface. 13) Bake for 50 to 60 minutes, or until a cake tester inserted between the tube and the side comes out clean and the cake springs back when pressed lightly in the center. The cake should start to shrink from the sides of the pan only after removal from the oven. way to refer back to a test, especially if it was a success. 14) Let the cake cool in the pan on a rack for 10 minutes. Use a small sharp knife to dislodge the cake inside the rim of the pan. Loosen the cake by jiggling it up and down until it moves slightly. Invert it onto a wire rack, coated with cooking spray. Cool until lukewarm. 15) Wrap the entire cake with plastic wrap. This will keep the cake moist. * A 10 cup bundt pan can be used. The cake will rise above the center tube during baking. Depending on the pattern of the pan, the bottom edge of the cake may break off in places as you are cutting it, OR remove some batter for make 2 cupcakes to bake for 20 to 25 minutes. * I used Valrhona Caraque 55% 1/2 inch wide block chocolate for the curls.